Use the gray/green 3 x 5.5 x 7" Domke 2-Compartment Insert as a replacement, spare, or new insert for your Domke F-6 and select other camera bags. The insert is constructed from padded nylon for impact protection, and features touch-fastening fabric. Sewn walls and bottoms help the insert maintain its shape. Box Dimensions (LxWxH) 12.1 x 12.0 x 0.9"
2-Compartment Insert for F-6 (Gray/Green) is rated 4.2 out of 5 by 21. Rated 5 out of 5 by Rebeckyruth from nice, fits right into my North Face bag! Bought the insert as an answer to my long-time search for an inconspicuous camera bag. This holds my 75-300 lens and my external flash. I also bought the one compartment to hold my camera steady. My accessories fit nicely in the bottom of the larger one-compartment. Foam not the thickest, but will aid in protection. Close fit for less room to bobble around. Two items fit nicely in my North Face, semi-waterproof, small base camp messenger bag...Heading out now for pics on the go! Rated 3 out of 5 by Miguel from Provides Sufficient Protection I use this the Domke F6 and it fits well with the included insert. The version I received has a removeable divider that can be difficult to adjust. The good news is that when it's set in place, you'll feel confident that it's going to stay there. I often use it without the divider to carry a camera body by itself or in combination with a small lens..for example: either a Leica MP with a 35mm F2 Summicron, a Nikon FM3a with the pancake 45mm, or a Sony RX1. While the Domke inserts have improved over time, I still think the seams could be sewn. Overall, I'm satisfied with the product and would purchase it again if needed. Rated 4 out of 5 by Anonymous from Good, but only for small lenses I bought this 2-compartment insert for my F-6 bag but I ended up returning it because the compartment is too small for any lens that is bigger than 52mm diameter. Construction is good and well built but again be advised that the compartment will ONLY fit small lenses that are 52-58mm in diameter. Rated 5 out of 5 by Jack Of Many Trades from Perfect Insert for Micro Four Thirds The inserts can be used with the Think Tank Retrospective bag series. The inserts are from the Domke F-6 Ballistic bag series. The overall dimension work great and do not get in the way of any internal zipper compartments in the T.T. retro bag models, 7, 10 or 30. I have a Think Tank shell and these inserts from the Domke ballistic series the velcro works for me. Of course they work great within Domke ballistic bag series. Rated 1 out of 5 by Birdshot from What happened, Domke? This is garbage! I've owned Domke bags for...oh, I dunno, about 30 years or so. Wore out several when I used them for work prior to my retirement. They were always well made and affordable. Today I still own several bags of varying sizes. I've always kinda liked their bags. Mainly, I use the Little Bit Smaller bag because I don't carry much equipment anymore. The LBS bag comes with a 4-compartment short insert but I also wanted a smaller insert, thus my order of the 2-compartment insert reviewed here. If you're considering this insert there's a few things you need to know.It's smaller than two of the compartments in the 4-compartment insert and the fit is narrower front to back. The separation of the two compartments is not stitched in, it's kept in place with a Velcro-like substance . The Velcro-like substance is trash, doesn't hold worth diddly. The padding is thinner than the 4-compartment insert that came with the bag. What this is, is a poorly padded, too small single compartment insert that Domke decided to make into a 2-compartment insert by including a little piece of nylon covered thin foam with fake Velcro stitched on that doesn't work . If what you really want is a one-compartment insert that's a little on the small side, you should order this. Otherwise, look elsewhere.Essentially, if you intend to use this as it is intended--you can't. I can't fit the Canon 50/1.4 and 35/2 lenses side-by-side in the insert. Too small. These lenses fit fine in two compartments of the 4-compartment insert. At this point, I would caution anyone who has been buying Domke bags to carefully check them in the future before purchase. They may not be what they used to be. This insert sure ain't.I would return this silly thing for a refund since it cost me $ bucks. But it's not worth the trouble to have to ship it back to B&H. I'll either toss it in a box with the other now-useless photo gear I've accumulated over the last 40 years or I'll attempt to find a use for it as a poorly padded single compartment insert in one of my older (good) Domke bags. Rated 5 out of 5 by Vosges1945 from More than just for camera equipment... The Domke name is well known for camera bags and such, but the inserts are great anytime you need to organize storage in a carrying bag. Whether it's a messenger bag, gym bag, or tote these inserts will do the job. This insert is perfect for keeping smaller items in one place in a bag; I use it specifically for keeping candies, antacids and cough drops in one place. The insert is thinly padded for protection, doesn't take up a lot of space and has velcro to anchor the insert if you have velcro inside your bag. The only negative point I can think of is the darker color can make it harder to find smaller items in the bottom of the insert in lower light conditions. All in all an excellent tool for organizing you bag. Rated 4 out of 5 by Shadyapex from Good for light gear. 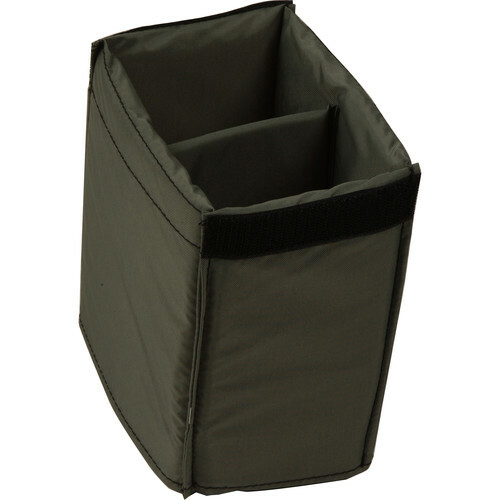 These are great inserts that you can use in almost any bag but they're kind of light. I'm using them in my Domke F-3x. Great for your rangefinder and lenses, small digitals, etc but probably won't provide the protection you want for your SLR and fast zoom glass. Rated 5 out of 5 by Anonymous from Nice and handy for the smaller bags I use the Domke F6 and other assorted bags that are even smaller when I just need a couple of lenses. The two compartment fits nicely for that as opposed to the four compartment which is a bit too large for me.